AIYD’s Shaun Star and Rishi Suri co-authored an article on ‘Youth in Forefront of Australia-India Ties’ in The Pioneer on 22 September 2014. The article stresses the importance of people-to-people between the two countries links and the role being played by the Australia India Youth Dialogue in this context. Last week’s visit by Australian Prime Minister Tony Abbott to India marked a number of significant milestones in the bilateral relationship. While media reports highlighted the signing of the civil nuclear cooperation agreement as symbolic for the bilateral relationship and as important for India’s growing demand for energy, a number of other noteworthy policies were launched during Mr Abbott’s visit which focuses on facilitating people-to-people links between Australians and Indians. The value of promoting such people-to-people links should not be understated and the Government’s renewed focus on promoting such links should be applauded. While high-level policy developments are strategically significant and, therefore, probably attract more media attention, it is the people-to-people and institution-to-institution ties which give much promise to an enduring relationship between Australians and Indians. One initiative which was launched during Mr Abbott’s visit is the New Colombo Plan, a programme under which young Australian students would study in institutions in India, promises to further youth and academic exchanges and promoting contacts. Such initiatives are exciting because they will enable young Indians and Australians to personally experience the other country’s rich and diverse culture and to develop a deep personal and professional network in another country. It is on this premise that the Australia India Youth Dialogue was founded in 2011. In a few months, 15 young leaders (under 40 years of age) from India will visit Australia to meet and engage with 15 of the best and brightest young leaders of Australia. Over the 3-day conference, AIYD 2015 delegates will discuss critical issues in the Australia-India relationship and key challenges and opportunities facing the two countries. The AIYD aims to encourage young leaders from Australia and India to collaborate on projects that are beneficial for the Australia-India relationship. Various projects and collaborations initiated by young leaders who have participated in the AIYD are showing great results. Joint initiatives like ‘One Australia’, a music video by Amoghavarsha JS, a wildlife photographer by profession who travelled 7,000 kms throughout Australia for one month after the AIYD 2013, putting together a montage of his journey was very well received. A sports task force report produced jointly by Amrut Joshi and Jacob Taylor has set forth new facets of sports collaboration between India and Australia. Even in business, our young leaders continue to build strong professional networks across the Australia-India relationship. 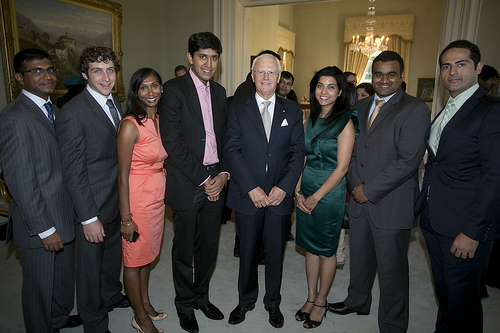 The NSW Australia India Business Council Young Professionals Chapter, which was set up by one of the co-founders of AIYD, is an organisation which encourages such ties. AIYD also closely works with Young Indians, an integral part of the Confederation of Indian Industries on various events through their former national chair Shankar SV and current national chair DNV Kumara Guru, both of whom are AIYD alumni. After only four years and three dialogues, the AIYD has shown tangible results and managed to form a terrific sustainable network of young leaders from India and Australia. The continued success of this forum is testament to the energy, dynamism, creativity and support of the young delegates who are involved in the programme. The strong ties between the current Australian and Indian Governments send a signal to young leaders who would like to be involved in growing the bilateral relationship from strength to strength. After all, the future of the Australia-India relationship rests in the hands of young Australians and Indians. This article was originally published in The Pioneer on 22 September 2014.For the original article, please visit www.dailypioneer.com/columnists/oped/youth-in-forefront-of-india-australia-ties.html.